Budgeting is Hard, But Here Are 8 Tips to Make It Easy! Sticking to a specific budget is not always easy. From holiday spending to emergencies to everyday purchases, the household budget can easily fall to the wayside. If this sounds familiar, you’re not alone. Simply relying on willpower and discipline for your budgeting is hard. What really works is automating what you can and getting smart about where you spend your money. Here are 8 tips you can try to help yourself stay on track. If you already have your phone in hand, why not download an app to track all of your spending? Many banks offer free budgeting tools, based on debit card transactions. Log in to your account and take a look. Free apps like Mint can also show you exactly where your money goes, separating transactions by category in easy to understand tables and graphs. You can visually see where you spend too much and make adjustments. It can be tempting to pay a bill late in order to buy something else. However, putting bills first by auto paying them can eliminate that temptation and keep you on track. Even if you normally pay your bills on time, it is easy for one to slip through the cracks. Then you might think you have more money than you do, and you could get hit with late fees and service interruptions. Schedule an auto-payment date that works for you and sign up for electronic receipts (a notification or an email that the transaction occurred). Set up your direct deposit so that a portion of each paycheck goes straight to savings before you even see it. You can do this through your employer’s payroll service, or through your bank. If you manually deposit your pay, it’s up to you to put the allotted amount into savings each time. Do you have expensive cable service but you rarely have time to sit and watch anything? I used to spend around $100 per month on cable but switched to Netflix for $10 per month. You can also pick up movies, magazines and books at the local library for free rather than buying or renting them. Also, check your local newspaper, the coupons that arrive in your mailbox and online deal sites for free or low-cost concerts, movies, and other events. 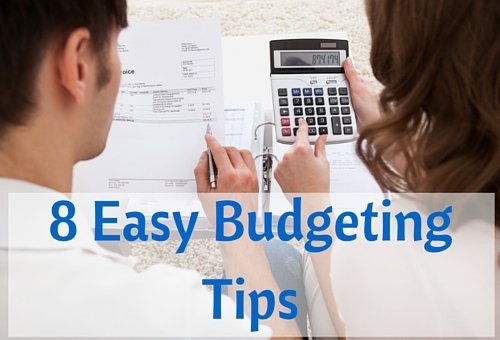 A little bit of effort can lead to huge savings and an easier time budgeting. Food is often one of the most frequent, necessary, and expensive items in the budget. The temptation to swing through the drive-through can be strong. If you’ve already got a delicious dinner planned at home, the temptation is easier to resist. You can, of course, eat out sometimes. But it should be the exception, not the rule. Google recipes. Start on your favorite recipe site or by typing in the ingredients you’ve got on hand, followed by the word “recipe.” (If you’re on a tight budget or new to cooking, we love this free cookbook.) Buy staples in bulk (olive oil, butter) to save money. Shop according to a list, not whim. Another word of advice: don’t shop when you are hungry or stressed. The key is to experiment so that you find recipes you and your family like. Gas is another expense you can cut down on by planning ahead. First, get the cheapest gas in town by downloading an app like GasBuddy that lets you search the city you live in for the best prices. Then think out all the errands you need to run and how you can do them most efficiently during the week. When you know where you need to go, use Waze to find out about any problems on the road so you don’t find yourself stuck in traffic or taking a detour. Don’t forget about carpooling with friends when it makes sense. There’s even an app for managing your carpool schedule! Are you paying monthly fees for your phone, car insurance, credit card interest, and bank accounts? In our competitive market, companies frequently change their offers and run promotions. They want to keep existing customers, which gives you leverage. When paying my monthly phone bill, I asked about getting a discount on my services and learned they offered 15% off for AAA members. Just by asking I cut over $20 from my monthly bill. Also, check your credit report to find out if you have improved, as better credit can help you get better rates, especially for products like insurance and credit cards. Credit Sesame is a great resource for getting free credit report cards. Lastly, if you have a specific goal you want to save for like a vacation, the down payment on a house or an emergency fund, you can make that goal more tangible with a goal-oriented savings account. Put a name on the account and separate it from your other savings. Goal accounts can be strong motivators. Sticking to a budget, repaying debt, and saving money can be hard, especially if you have never done it successfully before. Don’t get down on yourself about it. Instead, take action using tips like these to support your efforts and relieve some responsibility from your willpower.